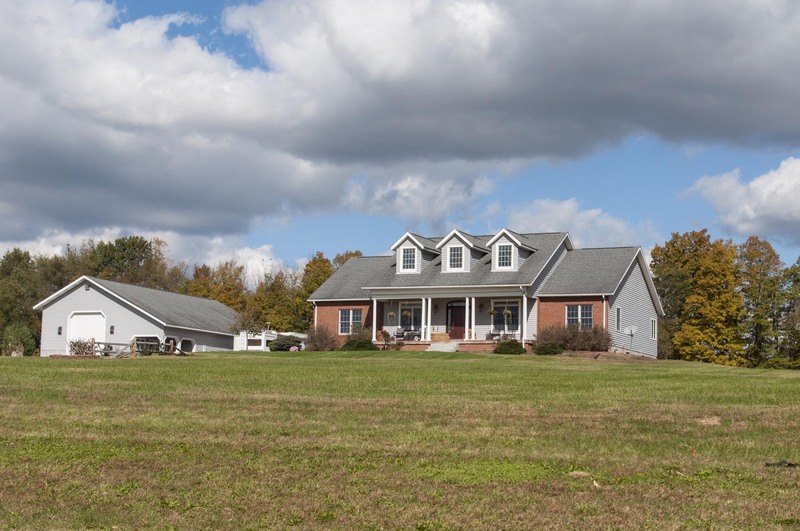 Beautiful Amish constructed cape cod style home situated on 5.3 scenic acres in the gently rolling hills of Knox County features 3 bedrooms & 3 full baths, living room with soaring 19′ ceilings & Xtrordinair gas log fireplace, formal dining room, den and main floor laundry. Quality throughout from the beautiful hickory cabinet filled kitchen w/major appliances & granite counters with adjoining breakfast area to the stunning hickory wood floors. The master bedroom suite features dual vanities, a walk-in shower plus a large Pearl whirlpool tub. A second bedroom includes a full private bath. A 12 x 29.5 ft bonus room over the garage awaits your finishing touch of the flooring of your choice. This home is minutes from Mount Vernon Nazarene University & Kenyon College and w/i an hour of metro Columbus. Store your tractor, boat and RV or even your big rig in the 16′ tall 40 x 64 pole barn w/ 14 x 12′ high door plus additional storage in the 14 x 64′ loft and 220 electric. Click “More Info” for MLS details and photos. Navigate through the home by clicking the lightly colored circles on the floor or dragging your mouse.